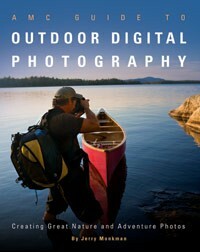 AMC Guide to Outdoor Digital Photography, by Jerry Monkman, 2011. Written by renowned conservation photgrapher Jerry Monkman, this beautifully illustrated, large format book features all the fundamental techniques and concepts needed for outdoor photography. The author covers gear, telling stories through photos, shooting under different conditions, composition and exposure, processing with editing software, and keeping photos organized and safe. Features a number of case studies with detailed explanations. 184 pp., 8" x 10."